You will spend approximately a third of your life sleeping – why not make those hours as enjoyable as possible? Stop spending your nights staring at the ceiling when you buy the Comfort In A Bag Bamboo Pillows: 2-Pack. The pillows are on sale for $49.99. Bamboo fiber is a natural fiber safely used for centuries. The bamboo cover case of these pillows is designed to never go flat during the night. The multi-layered hypoallergenic foam will help you breathe easier and lasts longer than down pillows. If you suffer from insomnia, migraines, or joint problems, the Comfort In A Bag Bamboo Pillows conform to your body and improve your posture. The price has been reduced by $150. The cases are machine washable and the neutral tone matches any bedroom decor. 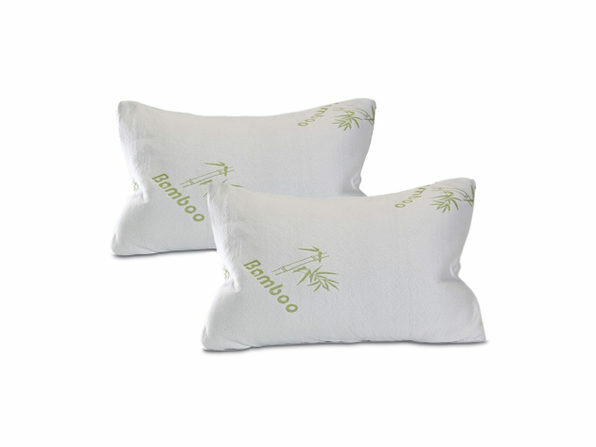 At the reduced price of $49.99, buy multiple sets of the Comfort In A Bag Bamboo Pillows: 2-Pack for your guest bedroom. Skip counting sheep to fall asleep when you buy the Comfort In A Bag Bamboo Pillows: 2-Pack in the Daily Caller shop for a sales price of $49.99.